Welding is a fabrication process used to bond metals together with the help of a filler material. The gas, light, and heat given off during this process is considered extremely unsafe without the proper protective equipment. A Welding helmet is a type of PPE (Personal Protective Equipment) used to guard the head, face, neck, and eyes from ultraviolet light, sparks, infrared light, and heat during the welding process. They are considered a secondary protection and should be used with either safety goggles or safety glasses since most face shields do not meet ANSI Z87 standards. When it comes to welding helmet components, there will always be significant differences in quality from one brand to another. Before a decision can be made on a particular brand or model, it’s best to examine the differences in each and how they will benefit the various welding processes. 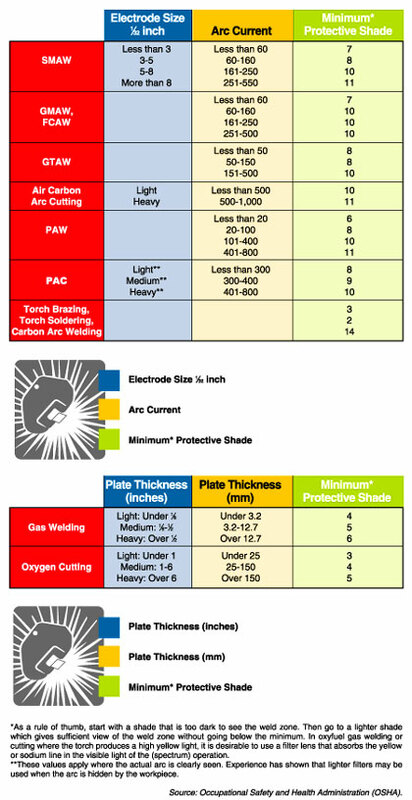 The basic components of a welding helmet are listed below with their possible production materials and options. Since there are numerous helmet styles, the most basic will be listed. The Shell – Most, entry level, welding helmet shells are made from nylon. Nylon is a good all around material that is lighter than fiberglass and extremely durable. Professional welding helmets are often made with NORYL or AMODEL. NORYL and AMODEL are higher quality materials that will outperform nylon in almost every significant welding-related category. They are a bit more expensive but will last 2-3 times longer than their nylon counterparts. The Lens – There are a variety of welding helmet lens/filter options. The one you choose will ultimately depend on the particular type of welding being performed. Fixed/Passive Lens – This lens type has a permanent shade that will not allow the user to see the welding area unless a live welding arc is present. A passive lens utilizes UV/IR coated glass with a permanent shade value of at least 10. This is an older style that is still often used by hobbyists because it is the least expensive. Auto Darkening Lens – These lenses can automatically increase the lens shade to compensate for more intense light. This is a convenient feature that allows you to keep your helmet on throughout the entire welding process. Can come in fixed or variable shades. Usually a bit more expensive. Lens Viewing Size – The size of the lens or filter is important when deciding upon a welding helmet. Older helmets would typically have viewing sizes that range from 6 sq. to 9 sq. inches. Now, a welding helmet lens viewing size can be as large as 24 sq inches. The Suspension/Headgear – Most welding helmets are manufactured with a ratchet suspension. It can be adjusted to a workers head with a quick twist of a knob near the back of the head. This loosens or tightens your welding helmet “on the go”, without having to remove it. It will also typically include a foam padding on the forehead for comfort. Inexpensive welding helmets may utilize a pin lock mechanism for fitting. Pin locks are similar to the fittings on the back of baseball caps. There are several welding processes that use a variety of energy sources. Each source will have different inherent dangers, so choosing the correct protection is vital to the user’s safety. The light given off during welding can cause retinal damage with unprotected exposure. Welders can protect themselves from this light by using dark shades or filters that allow them to look safely at the welding point. According to OSHA, the type of welding application will ultimately determine the correct filter shade to use for eye protection. They recommend that welders start with a shade that is too dark to see the weld zone, then go to a lighter shade that allows for a sufficient view without going below the minimum recommended protective shade. The illustration below is a lens/filter guide that gives recommendations for protection with certain kinds of welding. Fixed Shade – A fixed-shade lens darkens to a predefined shade level as soon as it senses an electric arc. An economical auto darkening option. Variable Shade – A variable shade lens darkens in relation to the brightness of the arc. This feature is useful if the user often performs several different types of welding. These lenses will usually have the ability to adjust as needed. Power Source – There are usually two types power sources used to control the darkening functions of a welding helmet. There are battery-powered, solar powered, and then combination units that use a little of both. Solar powered filters are efficient and reliable since they use the light from the arc as the energy source. Battery-powered welding helmets can use either standard NiCad or lithium batteries. The combination units pull power from the batteries with some assistance from the solar cells. Lens Response – The lens will respond to natural light with a shade of either 3 or 4. These levels are low enough to be able to see your work area. When an arc presents itself, it will begin to darken to the appropriate shade. A quicker response will normally equate to a safer helmet. Sensors – The number of sensors within a welding helmet will determine its auto-darkening functionality. More sensors will ultimately allow the helmet to easily identify a change in lighting conditions. Sensitivity Control – Auto-darkening helmets will typically provide the ability to adjust how much light is needed to trigger the darkening function. Sensitivity control is useful when welding at low amperages. Delay – The delay function enables the user to set the amount of time it takes for the lens to lighten after the welding arc is gone. This is useful if different types of welding are being performed. Taking the time to explore the different types of welding helmets and the latest advancements in lens technology will go a long in determining the type of helmet that is best suited to meet a welders demands.